An associate of three Kurdish women shot dead in Paris earlier this month has been placed under formal investigation for their murder. The 30-year-old man is described as a chauffeur to the Kurdish activists. One, Sakine Cansiz, was a founding member of the armed militant PKK. The three were found shot in the head in a Kurdish community centre in Paris. Turkey has implied they may have been the victim of an internal feud. Others suspect Turkish ultra-nationalists. The suspect, Omer Guney, was one of two ethnic Kurds arrested last week by a specialist anti-terrorist unit investigating the killings. The other has since been released. Mr Guney is under investigation for carrying out the murders as part of a terrorist group, and conspiracy to commit murder as part of a terrorist group, the French news agency AFP reported. "We believe he is likely to have been the killer or one of the killers," Paris prosecutor Francois Molins said. It has emerged that Guney had been a member of the PKK for the past two years and was the last person to be seen with Cansız on the security cameras, Turkey's Hurriyet newspaper reported. Gunshot residue was reportedly found on his clothes. Mr Molins also said all three women were killed with one gun, adding that the reason for the murder had not yet been determined. 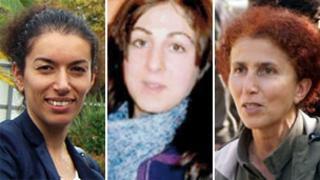 Ms Cansiz, Fidan Dogan, and Leyla Saylemez were shot days after Turkey announced it was holding tentative peace talks with the PKK's jailed leader, Abdullah Ocalan. The Turkish government suggested the attack could have been intended to derail the peace process. But French police are also examining whether the killings were linked to extortion rackets used to raise funds for the PKK from the large expatriate community in western Europe. The PKK is regarded as a terrorist organisation by Turkey, the EU and the US. It launched an armed campaign for Kurdish autonomy against the Turkish government in 1984, since when more than 40,000 people have been killed.